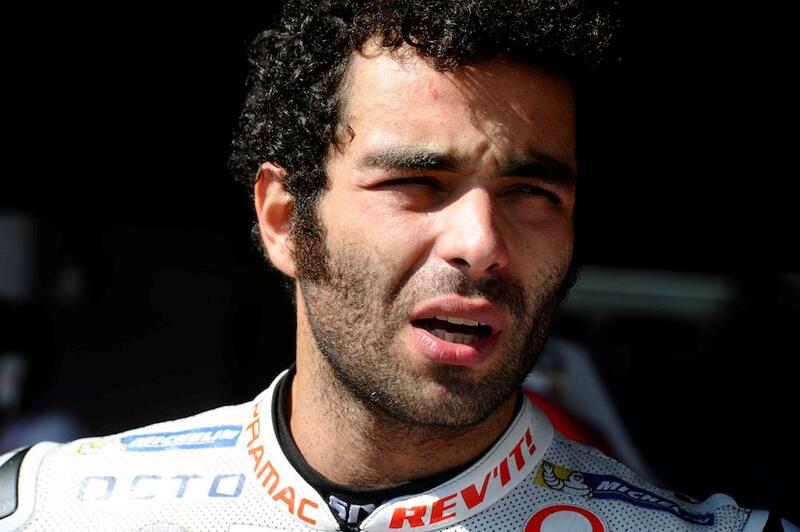 Danilo Petrucci is sporting a number of injuries ahead of this weekend’s British Grand Prix after falling off his father’s scooter in Italy last week. The Pramac Ducati rider, who finished on the rostrum at Silverstone last year, was on his way back from having his hair cut when another vehicle collided with him on a roundabout, knocking him to the ground. Suffering a number of bad cuts and grazes, Petrucci was unable to train for a couple of days but isn’t expecting the injuries to hamper him this weekend. “I asked my father if I could borrow his new scooter as I had to go 5km to the hairdressers,” he explained. “I wear no shoes, just flip flops and shorts. I went to the hairdresser, they cut my hair, then in a roundabout on the way back I saw this old man and he was on the telephone, didn’t see me and hit me on the back of the scooter. I crashed, but fortunately I only slid but the ground is always hard! I immediately stand up and he said ‘ah, you are okay, we can go!’ and I looked at my father’s scooter destroyed, with the front wheel still spinning like in the cinema! I say, ‘no I think we have to stop a little bit’. “I got many problems, especially during the night as I can only sleep on one side and it’s quite difficult to get rest but apart from this I missed only two training sessions but I have been back at it now and I am ok.